This product will be available in March 2012. PRX400 passive speakers were designed to provide the sensitivity, frequency response and power handling needed for almost any professional audio environment while still being reasonably priced. Whether you use a powered mixer or an equipment rack full of amps and signal processing, PRX400 passive speakers deliver the sound power and bandwidth necessary to make loud music sound natural and even quiet speech intelligible. 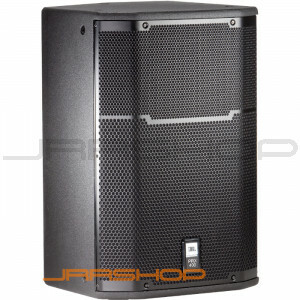 PRX400 passive speakers are comprised of tour tested JBL components and feature professional connectivity via Neutrik® Speakon combination connectors. PRX400 cabinets are artfully constructed from an 18mm Birch/Poplar multi-laminate hardwood covered in highly resilient DuraFlex™ and feature rugged 16 gauge steel grilles. All full range models utilize twelve M10 suspension points for safe deployment in light duty installations. With three 2-way designs and an 18" sub-woofer, PRX400 passive series tackle tough jobs affordably and professionally.